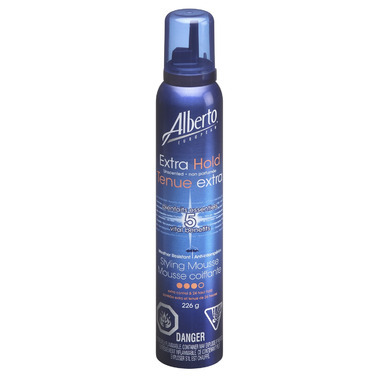 Alberto European Extra Hold Mousse provides long-lasting hold to give you greater control over your hairdo. Ideal for shorter styles, it delivers maximum volume with 24-hour humidity protection. It also contains a UV filter to help protect against environmental damage. Useful Tips: To get even greater long-lasting control, finish your style with Alberto European Extra Hold Hairspray. How to Use: Use on towel dried hair. Shake well before use. Release a ball of mousse into the palm of your hand applying evenly to roots and tips. Comb through and dry as normal. Avoid contact with eyes. What's in the Box: Alberto European Extra Hold Mousse, 226g. My husband loves this product. It is not scented (very important) and helps him place his thinning hair exactly how he wants it. Well makes it easy to purchase and I thank you. Not sticky and holds well. Very little scent, so not overpowering. Please keep stocking this. Excellent product and impossible to find unscented mousse elsewhere. I have chemical sensitivities and this is the best unscented mousse that I have found. Combats the frizzies and leaves the hair shiny and manageable. It has no lingering odor once your hair is dry. It`s a great product. Please keep it in stock because I will be back! Excellent product, no odor and keeps my hair place for 24 hours . I have SEVERE scent-related allergies, and I can honestly say that this is the FIRST mousse that is completely unscented AND works! I have naturally curly hair with a WHOLE lot of Frizz, and this stuff works wonders! I can go the whole day without worrying about frizz-patrol. So great! Will get again! I bought this because of my dad's scent allergies, and I have looked so hard to find a scent free mousse. This one works pretty good, I mainly use just a bit to keep some body and my curls. thank you for selling this and I could not find scent free styling products at my local store. Great for curls and wonderful value, especially for an unscented product! I can no longer find this product on store shelves, so thanks well.ca for making it available!